There are few places where Black children, Black girls in particular, are safe—not on unfamiliar streets, not in frequented neighborhoods, not in chaotic classrooms, and often not even in the place they call home. Those of us who care for these children recognize this and try to prepare them for the unwarranted hostility they will face. We give them “the talk” and careful instructions on “appropriate” behavior knowing these are not adequate remedies and likely won’t guarantee survival. Baldwin writes of the burdensome expectations heaped upon the shoulders of Black children by their well-meaning elders in The Fire Next Time. This norm drives the way we treat and talk about Black girls. They are trampled because we trade the possibility of survival for the freedoms afforded to the privileged. But there’s not much of a choice. 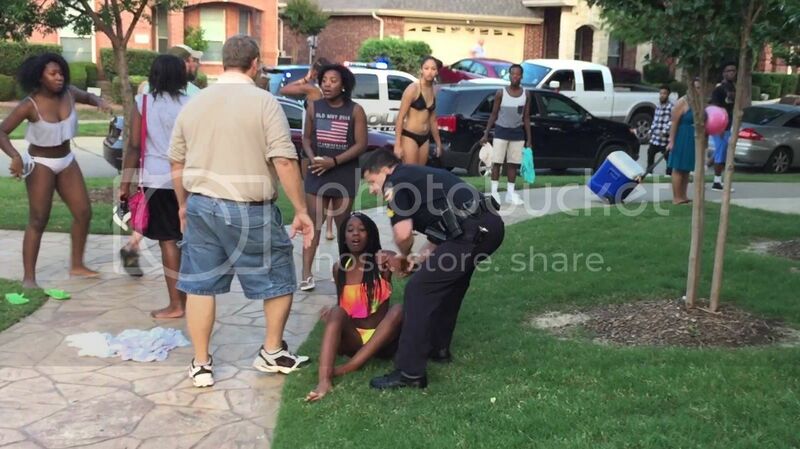 In McKinney, Texas police terrorized a group of Black kids in bathing suits because they violated the social order. These teens committed the crime of being Black in an upper middle class suburb. Video of the scene quickly went viral. Former McKinney Police Officer Eric Casebolt, visibly agitated from the moment he appears on screen, thinks nothing of drawing his weapon on frightened kids and throwing 15-year-old Dajerria Becton to the ground as she screams and cries for her mother. While he tossed her body around and pulled her braids, Dejerria yelled, “I’m not fighting you” — recognizing that she is no match for a grown man. Casebolt’s assault of Becton begins with the adult man telling her to, “keep talking” as she and other teens are walking away. Dajerria did, in fact, keep talking in what was her attempt to challenge patriarchal power. The officer responded to Dajerria’s outspokenness with violence to put her back in her place. I am unsurprised by the number of people twisting themselves into knots to excuse the abuse of a child. Many who express these sentiments experience the same manner of dehumanization every day. In this way, Black and White adults come together in the maintenance of white supremacy to facilitate the stripping of black childhood. But now is the time to break old habits. Dajerria is not at fault for what happened to her, and those trying to blame her for the out of control police have it all wrong. While we may endorse a respect for authority, at least outwardly, to keep Black children alive, they are not morally or culturally degenerate for not doing so. In fact, this resistance is essential to cultivating a spirit of resilience in young Black bodies and should be encouraged. Children are, after all, humans with valid and valuable thoughts and feelings. They may not always possess the capacity to express themselves in ways that make us comfortable, but that does not mean that their inclinations are wrong. The child reacted to the disrespect and excessive force of Eric Casebolt in her typical 15-year-old way, and he retaliated violently. Authority is a privilege, and with it comes responsibility. In this scenario, 41-year-old Casebolt is the failure. Running from cops and being disrespectful are not crimes. Continued focus on what Dajerria or the teens who attempted to come to her defense did wrong not only holds them to a higher standard than white teens but of the man with the badge and gun. Those who insist that this Black girl should have known to follow directions and heed authority in order to be treated as both a child and a citizen put forth yet another iteration of an old Black pathology argument. At best, officers should be obeyed not because they are right but because they have a capacity to kill, but that is a much different claim than the one made by “she should have shut up” crew. Brandon Brooks, the white teen who recorded the video, noted the clear disparity in how the police handled white and Black children. White kids walked by the officers untouched because their vulnerability was acknowledged. He notes that he was “invisible” to the officers as they hunted the non-white kids. Societally, we’d benefit from teaching Black girls a mutual respect for human beings from a young age rather than continuing to emphasize a hierarchy that devalues their lives without consequence. If children are no threat to themselves or anyone else, the only thing to be lost is the status quo. Of course Black children run from police as soon as they arrive on the scene. This post-post racial generation is coming to consciousness in the midst of a black freedom movement. News of racialized police misconduct dominates popular discourse, and each day incidents of excessive force come to light. Children are tasked with reconciling the mythology around policing with what they actually accomplish. This can be difficult for adults to unpack, so their adolescent frustrations are wholly warranted. Talk of respecting authority perpetuates the lie that individual actors are “bad” when the system is fundamentally corrupt. Moreover, McKinney reminded us that police are not the only authority figures children will encounter who care not for their basic humanity. Both a Texas elementary school teacher and Florida principal were removed from their positions for posting vile, racist musings on the incident on public platforms. These are the sorts of people who are in contact with Black children — the people they are told to mind without hesitation. The proliferation of the racist myth that Black children must be tamed has nothing to do with securing public safety or the innate dysfunction of Black children. Even those who believe themselves to have the best interests of Black children at heart would rather embrace it than reimagine the possibilities for their childhoods. For example, charter schools, some of whom employ questionable if not abusive tactics are championed by education professionals and the parents of poor Black and Latino kids. We should not settle for the use of constant surveillance to curtail typical childhood behavior. Normal kids push boundaries, and child psychologists agree that this period of testing boundaries in adolescence is imperative to healthy emotional growth. While most possess the capacity to be critical thinkers, the ability to synthesize and process information is a skill honed by continually questioning. Children should not accept any abuse they encounter with docility. They deserve better. I couldn’t have been more than four or five years old when my father was stopped for a traffic violation in the suburban Oklahoma town where we resided. He and I exited the vehicle upon the officer’s request. While one officer questioned dad, another held me face down in the back seat. I squeezed my eyes tight and prayed. I knew we were in danger. I have idea about what happened to my father during the time he and I were separated. We never discussed it. It must have been humiliating for a man who so fervently endorsed the respectability game. The memory of the officer’s clammy hands behind my neck and the back of my legs never escaped me. I’ve thought of the incident often, even sharing the story with friends, but I never thought to call it police brutality until the killing of Mike Brown. I did not have the space or vocabulary to do so. As I matured, I released the fear and learned how to name it. We must empower black girls to name injustice by refusing to let an oppressive culture stamp out their resilience. The very existence of Black girls, their defiance, and need to take up space is seen as a problem in ways it is not for Black boys. Black girls and their perceived mouthiness is not embraced as a sign of leadership or assertiveness. It makes them uncontrollable and unlovable. Responsibility for Dajerria’s assault can be placed wholly with the McKinney Police Department, but the words “Keep talking” with implied threat are spoken to Black girls often. They are muted routinely when in danger by those entrusted with their care. More than any other group Black girls survive sexual assault, and their continued exploitation is aided not only by white apathy but community complicity. When Black girls stand up, they can expect to be slapped down to maintain order; thus they are shamed, silenced and ignored. These girls need guides through the establishment of a new normal; one in which they are respected and whole and human. Black girls should mature knowing that they have a right to question those who seek to dominate their space, time, thoughts, and bodies. So while we continue to fight for Dajerria and all Black children, we must reject this hollow narrative about their existence. If liberation is the goal, we cannot forget the girls.